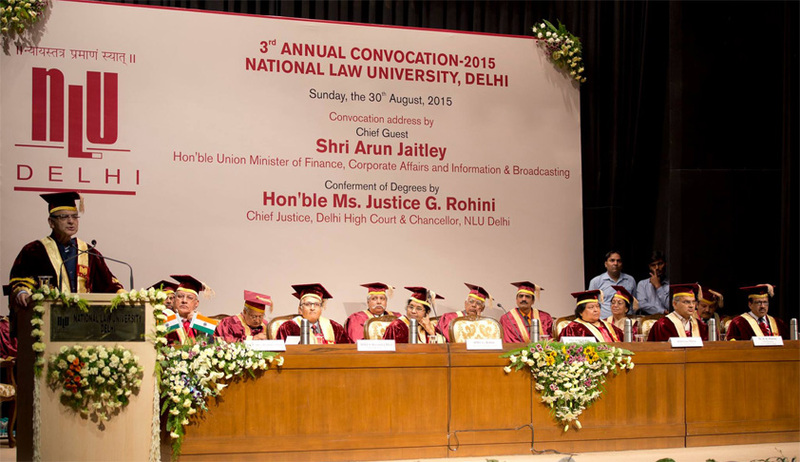 The third Annual Convocation of National Law University, Delhi was held on the 30th August, 2015. Sh. Arun Jaitley, Hon’ble Minister of Finance Corporate Affairs and Information and Broadcasting was the Chief Guest and delivered the Convocation address. Hon’ble Ms. Justice G. Rohini, Chief Justice, Delhi High Court & Chancellor of NLU, Delhi presided over the Convocation and conferred the degrees to 67 successful students of BA.LLB. (Hons. ), 21 students of LL.M & three Ph.D scholars. . Apart from this 24 Gold Medal and four Prizes to the stdents of BALLB(Hons) and two Gold Medals the students of LLM were awarded. Notable awardees are Mr. Punya Verma who was awarded six Gold Medals & one Prize followed by Mr. Sarvatrajit Singh Jajmann who was awarded four Gold Medals & one Prize. The Vice Chancellor Prof. Ranbir Singh welcomed all the dignitaries, graduating students and their parents and all other invitees. Prof. Singh narrated achievements of University and stated that it is constant effort of the University Faculty member to make the student worthy citizens of the society and to make the university best law school in India. Speaking at occasion, Union Finance Minister and senior supreme court lawyer Arun Jaitley noted with concern that legal academics faced massive manpower crunch and also said the best minds from the legal profession required to come forward to join the judiciary. “Fresh minds are also required while drafting legislation in tune with the modern trends. Traditional minds are not being able to produce it. We need a huge manpower in legal academics.”, said Jaitley. Observing that days of “grey eminence are over, Jaitley told law students: “lawyers do not excel suddenly at 60. I advise you to start early and fully devote for the cause”. “There was also a need that the best from the legal profession join the judiciary. Not only you need the best to join the legal profession, from the legal profession, you will need the best to join the bench. Because if the best do not join the bench, that itself creates pressure and handicaps the system, said Jaitley. “Pre-1991 the thinking was more regulatory and the quality of both legal education and litigation was quite average. After 1991 - economic liberalization - there's been an unleashing of energies and the citizens have become entitled to rise to the level of their own potential and, along with it, opened new areas for lawyers as well”, he said pointing out that these days youngsters are increasingly joining corporate law firms rather than taking interest in litigation. “Traditional areas of family disputes, land disputes, have been now replaced by those like international trade, taxation, and intellectual property”, he said. He also said that in today's competitive world, things like family, surname, hereditary or lineage would not matter but people would watch the quality and caliber. He also suggested to the students that there was no geographical limitations in the context of career opportunities. Addressing the law students, Jaitley further said the phrase 'brain drain' was no more relevant and India now has a brain bank that can serve the society, the country and the world.With its talented manpower, India can play a bigger role in the world, especially in the developed countries, which are facing shortage of workforce, he said. "The grant is not for buildings or flower arrangements but for research!" said Singh. NLU's best-known contribution so far has, of course, been the Death Penalty Research Project, in collaboration with the National Legal Services Authority (NALSA) and the 16 students who were a part of it received their citations too.